A good brush is like your favourite pair of well fitting jeans. Hard to find but perfect for you. Unfortunately this means that when the item in question reaches the end of its life span, we have a hard time finding a replacement. However, if like many, your brush is not looking its bristly sturdy self then it sounds like you need a new one and you will not have to look to far! Winner of Frizz Magazine’s Dream Factory Innovation of the Year 2007 and having been recently voted Grazia Magazines product of the week, The Tangle Teezer is a unique hair care tool that banishes tangles and knots on contact. The product prevents breakages, splitting and damage to the hair and can de tangle wet or dry hair quickly and painlessly. This product is the brainchild of celebrity hair colourist Shaun P. He has had over 30 years experience in the business so we know we can put our trust in the quality of this product. The brush is suitable for all hair types which are prone to tangle and even works well on wigs, hair pieces, clip ins, black hair, wefts, weaves and last but not least, problematic children who hate having their hair brushed. 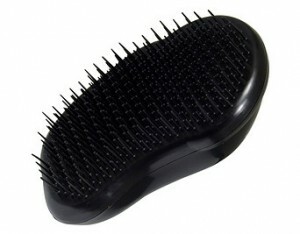 The Tangle Teezer is priced at £9.77 and is available from HQ hair.